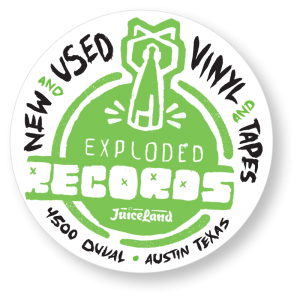 Exploded Records at JuiceLand is centrally located at 45th & Duval in Austin, TX. We provide a small, choice vinyl selection at other JuiceLand shops around Austin. Stop by any of our other locations below and see what we’ve got. Got stacks of vinyl collecting dust? We buy & trade used vinyl of all kinds! Contact us via email or at 512 662 1029 with any questions.